I can’t believe that we’ll celebrate Thanksgiving Day just in a few weeks. This is a special holiday for me when I can express gratitude for all my blessings, spend an unforgettable time with my family and enjoy savory aroma of a roast turkey and other festive dishes. This year I’m going to host a Thanksgiving dinner at my home. On the one hand, this expectation makes me very happy since I’ll have a wonderful opportunity to meet my parents whom I haven’t seen for three months. On the other hand, the preparation to the holiday induces much stress and worry as I have to do plenty of things for my dinner to be a great success. That’s why I should plan every detail of my Thanksgiving celebration in advance and it’s high time to start preparing right now. Here are a few things I do now to get ready for the perfect Thanksgiving feast without stress and anxiety. While I can call each member of my family any moment and invite them to the long-awaited party just in several minutes, I think that by sending individual invitation cards to my guests I will add more solemnity to the holiday. Nowadays we can find a big choice of various cards in every supermarket. If you are very busy, it would be a nice idea to buy them in order to save your time. Moreover, there are lots of online services that offer special invitations for your guests. Personally I want to surprise my family this year. So, I will make unique cards with my daughter. This way we’ll have fun and prepare to the festivity at the same time. Undoubtedly, a menu is one of the most significant aspects of every party. Therefore, I need to create the one that will impress my guests. I have already started to browse different cookbooks and websites in the search of interesting and unusual recipes. Surely, the roast turkey will be the main attraction of my festive table. I will also cook vegetable side dishes like mashed potatoes, green beans, gravy and a couple of light salads to add more diversity to the menu. I can’t imagine Thanksgiving without desserts. At this time we have a variety of seasonal fruits and vegetables that can be used to make numerous pies and biscuits. Pumpkin pie is my favorite dessert for Thanksgiving and I’ll obviously include it into the list of dishes this year. Now, when I have a clear vision of the foods to cook for the upcoming holiday, I can write down the menu and all the recipes needed. My Thanksgiving menu is ready and it’s time to make a grocery list of the ingredients I should buy in advance. Actually I always put down all the foods necessary for cooking holiday dishes and then I tick off those that can be purchased ahead of time. For example, it’s okay to buy boxed, canned and frozen goods right now. Don’t forget about the turkey as well. If you decide to purchase the foods two days before the holiday, you’ll have to wait in long queues, the prices will be much higher and you might not find certain items. First of all I’ve cleaned out my fridge and pantry so that I have enough storage for the groceries I will buy in advance. When you go shopping, make sure you’ve put on your grocery list staples such as napkins and paper towels. 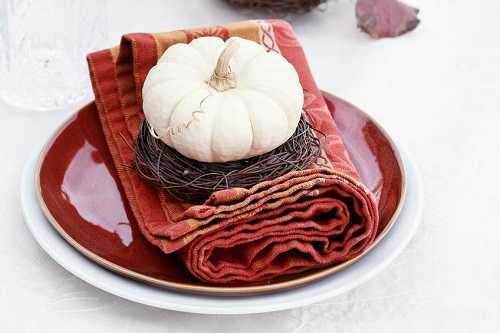 Decorations are an integral part of every holiday and Thanksgiving is no exception. Things like pilgrims, cornucopias, pumpkins, turkeys and Native American symbols are the best choices that will help me to create a delightful and cheerful atmosphere in my home. Thanksgiving Day is around the corner and it’s a great time to go shopping for these decorations without any delay. In addition, some natural materials such as autumn leaves and pinecones are going to be an excellent decoration for my house. Next week I will start working on various Thanksgiving crafts, involving my daughter and nephew into this pleasurable activity. Colorful centerpieces, candles, napkin rings and place cards are the basic elements I traditionally use to enrich the overall look of my table. Surely, if I clean up my house right now, it will be messy again just one week later. Nonetheless, there are certain household chores I can tackle successfully within the next few weeks. For instance, washing my tablecloths, cleaning windows, polishing silverware and getting rid of unnecessary stuff in my guest room are the most useful things to do these days. They will help me to avoid haste and chaos when I have to cook plenty of dishes the day before Thanksgiving. Thanksgiving is generally associated with joy and laughter. If your family simply sit in front of the TV set when the dinner is over, they might get bored soon and the celebration will lose its significance. There is a wide range of activities to try with your family. Playing board games, telling interesting stories or taking a walk is an excellent way to stir up excitement and bring the whole family together. Don’t waste your time; start thinking of the ideas on how to entertain those you love after the festive dinner. Preparation for Thanksgiving requires lots of effort and time. Due to this we shouldn’t put off all the tasks till the last minute and do a little bit each week getting ready for the big day step by step. By doing these things in advance I manage to enjoy a splendid celebration with my family. Have you already started your Thanksgiving preparation? What things are you going to do first?